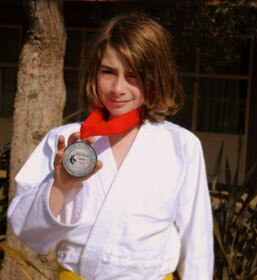 Sunday, November 10 marked the 60th Annual Palo Alto Judo Invitational. ISTP's Judo Club showed some true strength, but faced some tough opposition. Out of the 7 judoka from ISTP's Judo Club, three placed: (Nathan C., 2nd; Faiz H., 2nd; and Michelle P., 3rd). Winning and losing, in both cases, is the law of sport and it encourages our young athletes to train in a more intensive way. In the sport of Judo, honesty is of the utmost importance, and the continuity in the work, and the effort put forth in training sessions are part of the rigorous athlete's code of conduct. By practicing those values, the final and ultimate objective of each judoka is to exemplify those values in their day-to-day life as a growing child and then later, as an adult. Jigoro Kano, the founder of Judo, once wrote, "use this martial art, to become for the practitioner, a better human being, a better citizen." I know, for a fact, that all of our judoka gave the best of themselves. I am so proud of our athletes from the ISTP Judo Club, and ask that you join me in congratulating them on their sportsmanship. The next tournament will take place this Sunday, December 8, at the City College of San Francisco.